While reading commentary of Brihat Jataka, it appears that Varahamihira succinctly maintains a dasa system that is built upon planetary positions in kendra, panaphara and apoklima houses. It is different from Naisargika Dasa. Unfortunately, most of the Jyotish learners of present day think Brihat Jataka merely presents Naisargika Dasa which is indeed a misconception. Kendradhi planet dasa is also found in work of Yavanas. Prithu Yasasas (son of Varaha Mihira) elaborated the effects of this dasa system in his Hora Saara. In fact, half of Hora Saara comprises the results of dasa based on planets in kendra, panaphara and apoklima houses. Later, Kalyana Varma modified the Yavana’s and Varahamihira’s dasa system under the title of Moola Dasa. Kendradhi is often translated “kendra etc.”; literally it stands for “kendra and what follows it”. In simple words, sequence of kendra, panaphara and apoklima house groups. Planetary directional system or dasa, propounded by Yavana, Varahamihira, Prithu Yasasas and Kalyan Varma actually addresses Kendradhi Graha (that is planets in kendra, panaphara and apoklima houses). The key point of this dasa scheme is planets in kendra houses represent early life, planets in panaphara houses denote middle life, and planets in apoklima houses indicate concluding portion of life. However, mentioned authorities first determine stronger between Ascendant, Moon and Sun for starting point of dasa then consider kendra-panaphara-apoklima progression. At present, only JHora software provides Kendradhi Graha Dasa or Moola Dasa option, but the computational parameters are not clear (whether JHora’s Moola Dasa is based on Amsayurdaya, Pindayurdaya, Naisargikayurdaya, or modified criterion of Vimshottari dasa years with mooltrikona corrections). Further, there appears some deviation between classical teachings and what JHora output presents. For instance, there is no mention of Rahu and Ketu in Brihat Jataka, Hora Saara and Saravali (at least in their dasadhyayas), but we find Rahu and Ketu in Moola Dasa of JHora. Moreover no classical Jyotish text maintains that Kendradhi Graha or Moola Dasa basically reveals Karmic influences or past deeds of native. They simply treat it as an effective phalit dasa. Followers of recently emerged school of Tropical Vedic Astrology should especially test how Moola Dasa yields effective results, for, good or bad Moola dasa effect is depended upon planets in signs, rather special functional lordship and nakshatra taras. Moreover, the order of Kendra → Panaphara → Apoklima has striking similarity with Sun’s apparent movement through Moveable → Fixed → Dual signs of tropical zodiac. Students of astronomy know the seasonal change and day-night phenomena are caused by interplay of Sun and Earth that form the tropical zodiac. It is an entirely different subject, however, and present write-up has nothing to do with Tropical Vedic Astrology, or even computation, conditionality and applicability of traditional Moola Dasa. This article aims at finding whether planets in kendra, panaphara and apoklima show their effect respectively at beginning, middle and ending phases of life or not. Western historians are of the view that Kendra, PaNaphara and Apoklima are loan Sanskrit words that were probably adopted from ancient Greek terminologies sometime after Alexander’s invasion of Western India. In reply, conventional Indian scholars strongly decline this linguistic argument. In Classical and Medieval astrological practice, Kendra (Angle) was considered analogous to “beginning, central, and immediate”, Panaphara (Succedent) was equal to “accumulated or promised in future”, and Apoklima (Cadent) was synonym of “declining, remote, and far away”. This symbolism also helps in establishing following rules. Natural benefic planets (without inherent weakness and without malefic association) in Kendra Sthana or Angles (1st, 4th, 7th, 10th houses) indicate good fortune in early part of life. Natural malefic planets (without inherent strength and without benefic association) in Kendra Sthana or Angles (1st, 4th, 7th, 10th houses) indicate bad luck in early part of life. Natural benefic planets (without inherent weakness and without malefic association) in Panaphara Sthana or Succedent (2nd, 5th, 8th, 11th houses) foretell prosperous middle part of life. Natural malefic planets (without inherent strength and without benefic association) in Panaphara Sthana or Succedent (2nd, 5th, 8th, 11th houses) foretell miserable middle part of life. Natural benefic planets (without inherent weakness and without malefic association) in Apoklima Sthana or Cadent (3rd, 6th, 9th, 12th houses) suggest comfort and ease during last phase of life. Natural malefic planets (without inherent strength and without benefic association) in Panaphara Sthana or Succeedents (2nd, 5th, 8th, 11th houses) forebode misfortune in concluding days of life. Now the question is where is the borderline? How one can determine the end of beginning phase and start of middle portion of life. Different cultures differently perceive first, second and third part of life. It also depends upon native’s own longevity. Generally, 25 years for each phase of life yields quite reliable outcome, especially for common Asian natives, and for those who are not destined to very long lease of life. For European countries and USA, you may allot 30 years for each phase of life. It is up to astrologer’s experience and native’s own socio-cultural background. Citizens of higher life expectancy countries should also use this broader phases of life. The interval is coincidently correlated to Saturn’s 30 year cycle. Following are the delineations of Kendra, Panaphara and Apoklima Bhavas when they are occupied by natural benefic and malefic planets. For the sake of brevity, results are given as choppy sentences and keyword style. You may modify these results according to the signification of involved planets, and socio-cultural background of native. Fortunate birth. High social and financial status of parents. Getting due care in childhood. Receives good educational opportunities. Easily finds smart opportunity at start of career. Possibility of early marriage. Birth in difficult circumstances. Parents suffering from limited earning and uncomfortable living. Fear of malnutrition. Careless or quarrelsome parents. Occasional hurdles in proper education. Meager designation and salary at start of career. Family settlement or birth of child brings exponential rise in earning. Sumptuous wine and dine. Association with authorities causes high standard living and recognition. Expansion in business activities. Happiness from children’s performance. Entangled in search of desirable earning. Not receiving due reward and return of one’s own efforts. Frequent disputes in domestic life. Difficulties in procreating progeny. Sometimes, birth of child brings loss of job or destruction of business. Obtainment of effortless money. Children’s marriage in prosperous family. Travel for pilgrimage. Happiness on account of grandchildren. Availability of excellent medical care. Fame through literary work, Inclination towards spiritual quest and practice of rituals. Unexpected retirement or termination from job. Partition of family business and destruction of assets. Sudden decline in vitality and immunity. Frequent sickness and absence of medical facilities. Problems in marriage of children. Loss of property and relocation to ordinary house. Living in isolation and away from family. Almost every second chart has some planets in kendra, panaphara and apoklima houses. Then how we would reconcile contradictory planetary situation spreading in different kinds of houses? Here is simple solution. Since every kind of house group is consisted of 4 houses. That is, 4 kendra houses, 4 panaphara houses, and 4 apoklima houses. Therefore, we may rank 1 point to each house for the sake of ease and comprehension. Hence if all four kendra houses (1st, 4th, 7th, 10th) are occupied by benefic planets then it makes 4/4 = 100% favourable effect. When any of three out of four kendra houses are occupied by benefic planets then it accounts for 3/4 = 75% beneficial outcome. When only two kendra houses are occupied by benefic planets then it concludes 2/4 = 50% good results. When only one kendra house is occupied by benefic planet then it makes 1/4 = 25% favourable outcome and hence should not considerable. Following table illustrate the scenario for all houses. It seems indispensable to have few words about benefic and malefic planets. Almost all astrological authorities endorse Jupiter and Venus as two prime benefics, and Saturn and Mars as two natural malefics. Mercury and Moon are inherently benefics of second grade. However, Mercury’s beneficence is mainly depends upon on its good or bad association (sambandha), while Moon’s beneficence is primarily rests upon its brightness (pakshbala). Sun is basically cruel (krura), neither purely benefic, nor purely malefic. Yet, some treatises consider it malefic (except for religious and administrative affairs). On the other hand, lunar nodes (Rahu and Ketu) are fundamentally malefic. Despite few authorities consider them conditional malefics, since they do not rule any sign. One should never forget that concept of functional benefic and functional malefic is basically evolved to weight the Karaka and Maraka dashas as per Vimshottari. These special functional lords should not blindly mix with natural benefic/malefic lords. Earlier section of article presents six rules where terms of “inherent strength” and “inherent weakness” are mentioned. “Inherent strength” suggests planets in ucchabala (exaltation), digbala (directional strength) etc. Whereas, “inherent weakness” refers planets in debilitation, inimical sign, with zero digbala, in combustion, etc. For instance, in a certain horoscope, Sun and Mars are placed in 10th house and Saturn is sitting in 7th house then this situation does not necessarily shows poor and miserable early life. Despite, three malefics are in kendra, native will not suffer too much in until age 25 or 30. The suffering will be lesser than expected. The reason being, Sun and Mars in 10th house and Saturn in 7th house enjoy full digbala (directional strength). If said malefics further receive association and aspect of benefic planets then even lesser amount of difficulties are denoted. Nonetheless, mere strength of malefics will not turn into beneficence. As a result native has to face some hard luck and resistance in early life. 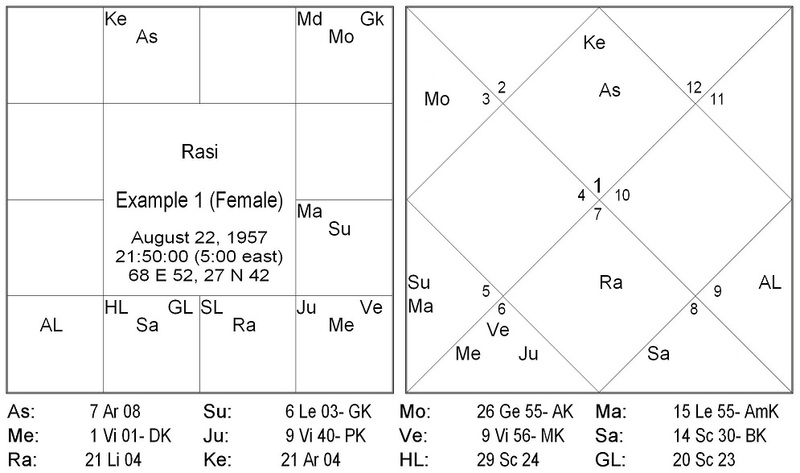 Say, in another horoscope with Cancer lagna, Jupiter is in 7th house and Venus is in 10th house. Here two natural benefics in kendra houses do not warrantee comfortable, supportive and well-off early life. First of all, both the involved benefics are with zero digbala (i.e. they are opposite to their designated directional strength). Secondly, Jupiter in Capricorn (without neechabhanga) finds it difficult to bestow its benign vibrations, and so as Venus in Aries. Nonetheless, bare weaknesses of benefics do not make them malefic. Resultantly, native will accrue only weak beneficial effect. A benefic is benefic after all, and a malefic is a malefic. Not enjoying powerful favourable results is not equal to facing unfavourable effects. The world is not black and white. There is always grey area in between black and white. Lastly, if a native is undergoing a very powerful (too good or too bad) mahadasha then advocated outcome related to three phases of life will not materialize. It should be borne in mind that theory of “Kendradhi and three phases of life” helps in understanding prosperous and miserable portion of life at a first glance of chart. By no means, it is not an alternate of Vimshottari or any other dasha system. Furthermore, here charts of kings, queens, presidents and prime ministers are not considered for testing the given above rules, since they’re born with highly powerful Raja Yogas in their charts that override general planetary dispositions. Hence following examples present charts of commoners. In example 1 chart, the panaphara houses (2nd, 5th, 8th, 11th) are exclusively occupied by three malefics: Saturn, Mars and Sun. Natural benefic planets do not aspect, associate, exchange or sandwich the said malefics. As a result, she suffered from continuous financial troubles during her middle part of life (around age 25 to 50 years). Domiciled in a squatter, she had to labour hard in order to run domestic affairs and educate her children. Some grave family disputes also happened with relatives in said middle phase of life. On the other hand, apoklima houses (3rd, 6th, 9th, 12th) are exclusively occupied by only natural benefic planets (Moon, Venus, Mercury and Jupiter). This is indeed a rare occurrence. In contrast to middle age, her old age is very comfortable and peaceful. Her sons settled well in their professions and her daughters got married in respected families. Recently she went abroad for pilgrimage too. Now she is happily living with her sons and grandchildren in a better neighborhood. At first instance example-2 chart looks awesome with four exalted planets. However, this person was born and bought up in a poor family. His first phase of life was quite humble and without any personal achievement. Kendra houses (1st, 4th, 7th, 10th) that rules initial part of life are occupied by three malefics (Saturn, Rahu, Ketu) and Moon. Here Moon has moderately strong despite being in exaltation. This is on account of lacking pakshbala and being under spell of Saturn’s aspect. He could hardly complete his intermediate from an ordinary government technical college. Parents’ weak financial standing forced him to stop education and started a job. After age 25, he found a good earning opportunity as an electrician in foreign country. 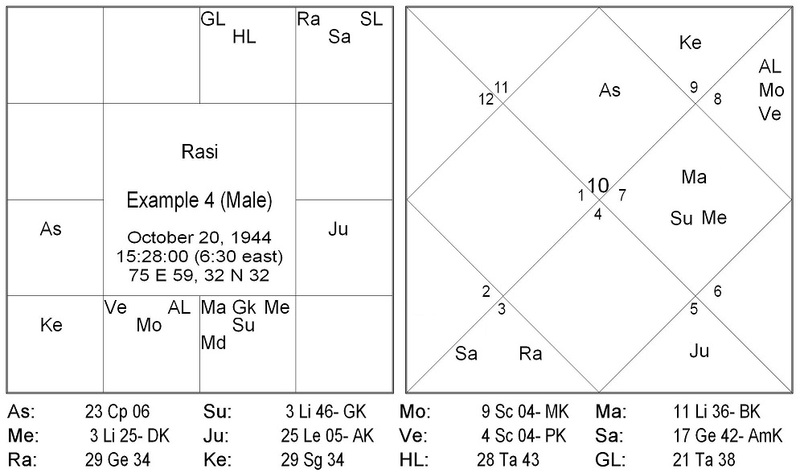 Note panaphara houses (2nd, 5th, 8th, 11th); where Venus, Mercury and Mars are assembled in 5th house. They are getting feeble support of trinal aspect of Jupiter. Out of these three; Venus is benefic and powerful, Mars is malefic, and Mercury is in a mixer of benefic+malefic (misra) and quite weak. Consequently, he earned well for some years and lived in a better neighbourhood (in foreign land). However, neither his social status, nor his financial position could improve. He had to retuned homeland after short span. Could not married yet, he is now working against an ordinary wage. Kendra houses (1st, 4th, 7th, 10th) are solely occupied by four malefics (Ketu, Saturn, Mars, Rahu). These malefics in kendra houses are without benefic aspect, association, exchange or sandwich. He was born in a traditional rural landlord family. Although he was not poor in his childhood, teenage and 20s but he could not complete his secondary schooling. His father died when he was young. As a whole, his early life was quite rough, without education, and characterized by useless wandering. He settled abroad in his middle part of life, and earned well through various business ventures (only Jupiter is in one of panaphara bhavas i.e. in 11th house). His financial status rose to very high after age 50. Note, Venus, Mercury, Sun and Moon are in apoklima bhavas (3rd, 6th, 9th, 12th) – that rules later phase of life. He settled to luxurious mansion of a mega city and enjoyed high standard of living. Despite, Saturn’s full aspect on benefics in 6th house does not yield smooth sailing. Moreover, Venus and Mercury are also combust. He simultaneously suffered unbearable loses in business, frequent health complaints and dispute with own son and daughter-in-law. Thus, mixed planetary dispositions in apoklima bhavas give him mixed results. Kendra houses (1st, 4th, 7th, 10th) are occupied by Mars, Sun and Mercury: two malefics and one benefic-turned malefic. Yet we cannot term Sun and Mars in 10th house powerless since both are enjoying digbala (directional strength). Moreover, there is an exchange between Venus and Mars. One of the major events of his early life was relocation, because his parents migrated to Pakistan from India after partition of 1947. He excelled well in his academic career, and ultimately become a doctor. Early life (birth to age 25) was ordinary except good education. In his middle life (age 25 to 50), he left medical practice and entered into hoteling business in a tourist destination. This venture led to exponential rise in his financial status and association with authorities. His sons also flourished well academically and professionally. Notice his panaphara bhavas (2nd, 5th, 8th, 11th) are exclusively occupied by three benefics (Jupiter, Venus and Moon). The dawn of concluding portion of his life (age 50 onwards) proved disastrous, especially with respect to investment and property. He was cheated in a big financial deal and lost a fat amount. This unexpected blow also hit his health. 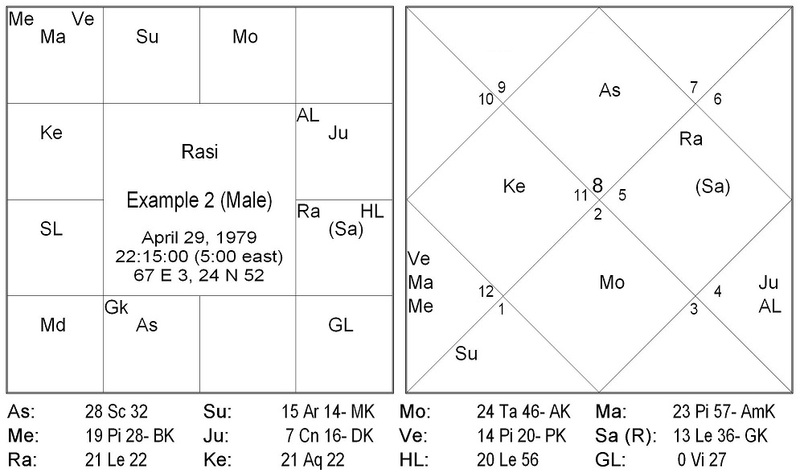 Observe his apoklima houses (3rd, 6th, 9th, 12th) where only Saturn, Rahu and Ketu are tenanted. Unfortunately there is not benefic influence on said malefics in apoklima houses, and hence there is meager hope of getting back lost money. Readers should also note planetary yogas that are exclusively related to any of kendra, panpahara or apoklima houses. When yoga is completely found in kendra-houses then it starts yielding its effect from early life. Yoga solely occupied in panaphara houses does not activate in early life, and start giving its result from middle life. Whereas, yoga completely formed in apoklima houses usually awakes only in old age. Take example of Gaja Kesari yoga. Obviously, Vimshottari dasa-bhukti of Jupiter-Moon, Moon-Jupiter, and their dispositors are pertinent candidates for Gaja Kesari effects. However, here we are analyzing yogas in terms of house groups (kendra, panaphara, apoklima). Say Jupiter and Moon are in (any) kendra houses then its effect should expect right from early age (birth to age 30). 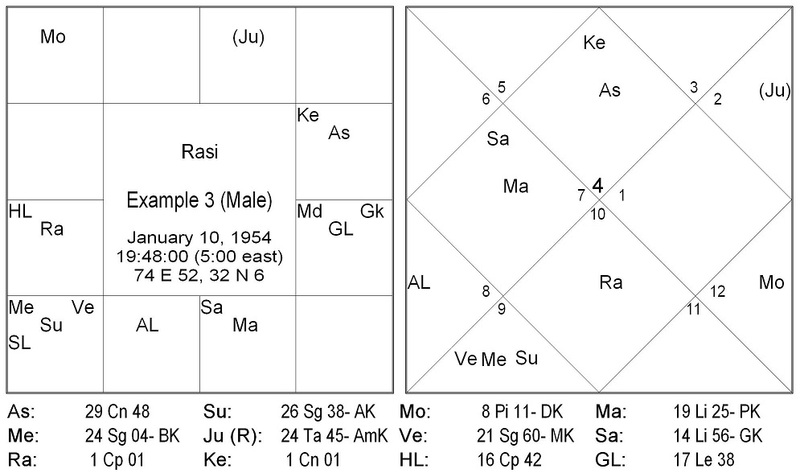 If Jupiter and Moon are in panaphara houses (2nd, 5th, 8th, 11th) then Gaja Kesri yoga will manifest mainly in middle life, and yield its effect related to significations of panaphara houses. Lastly, when Jupiter and Moon are sitting in apoklima houses (3rd, 6th, 9th, 12th) then such Gaja Kesari yoga will remain inactive in first two phases of life. It will only start giving its effect with the beginning of old age (generally after age of 50s or 60s). Even also observed when multiple planets simultaneously transit in kendra, panaphara or apoklima houses, they get activated, provided native is leading early, middle or last part of life respectively. For instance, a person has three natural malefics in kendra houses in birth chart. When Saturn and Mars, or even Rahu and Ketu simultaneously transit his/her radical kendra houses, and person is also young, then he/she faces extremely troublesome time. It is similar to reproduction or completion of Sarp Dosh. On the other hand, suppose another native was born with three benefic planets in panaphara houses (2nd, 5th, 8th, 11th). When Jupiter and Venus simultaneously transit his radical panaphara houses, and native is in his 30s or 40s then he/she finds lucrative earning opportunities, birth of child, benefit from association of authorities etc. It is akin to formation of Mala Yoga in panaphara houses. Rationally speaking, no theory can be accepted or rejected on the basis limited number of horoscopes. So is case with forwarded rules and their applications. However, astrology is not a quantitative discipline that can be tested statistically, nor it is an applied science that can be experimented in a laboratory. Astrology is a unique art whose fundamental principles and derivative rules are extracted from celestial symbolisms and movement of heavenly bodies. Kendra, Panaphara and Apoklima houses definitely carry some connection with first, middle and last phase of life. Under studied charts reveal planets in these houses manifest their good or bad impact. Nonetheless, advocated theory should not be considered substitute of Vimshottari or any other primarily applicable dasa. Scribe also came across few charts where three or even four kendra-houses are occupied by malefics but native was born in a good family, got caring parents and obtained nice education. In that case, native was going through (Vimshottari) dasa of benefic or yoga-karaka planet sitting in kendra house. This implies running Vimshottari or other applicable dasa yields pronounced effect in early life when dasanatha is sitting in kendra, middle life when dasanatha is occupied in panaphara house, and end of life when dasanatha is domiciled in apoklima house. In recapitulate, kendra, panaphara and apoklima houses denote three ladder of life. They manifest their vibrations in three different stages of life, sometimes meagerly, sometimes moderately and sometimes markedly. Varahamihira’s Brihat Jataka, translated by V. Subrahmanya Sastri, Mysore, 1929. Sanskrit Kendra is from Greek ke’ntron; Sanskrit Panaphara is from Greek epanaphora’; Sanskrit Apoklima is from Greek apo’klima. James H. Holden: A History of Horoscopic Astrology, AFA, 1996. See also David Pingree: Yavana Jataka of Sphujidhvaja, 1978. This is a kind of Mala Yoga. This is similar to Sarp Dosh.